The new Land Rover Range Rover Estate is a powerhouse, upmarket large family car that’s comfortable, luxurious and spacious. It’s also very, very big and sports titanic-like dimensions, as well as an appetite for off-road thrills and spills. After all, despite its upmarket airs and pretensions, this is still a proper workhorse. It’s just that it’s a workhorse with wood veneer. Oh yeah. 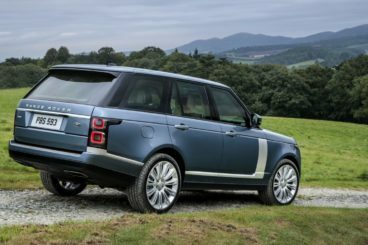 OSV takes a closer look at what it’s all about with our 2018 Land Rover Range Rover Estate review. As mentioned, this is a hefty machine, but it’s actually some 420kg lighter than last time. What this means for its on-the-road ability is that it handles better than ever. It might be huge, but you’re not always aware of its bulk. That said, if you want your Range Rover to handle like a dream, you’ll need to splash out on the SV Autobiography Dynamic model. Its steering and suspension has been modified, while its ride height has been lowered to ensure that you can take bends with enthusiasm and confidence. The rest of the range has less muscle, and they’re not quite as responsive to drive. They also lean in bends more. That said, all models offer a high view and visibility is therefore awesome. On the whole, the car offers a rather serene and enjoyable driving experience on-road. Off-road, the Range Rover is positively vicious as it takes a “no prisoners” attitude to the so-called difficult terrain. It’s arguably one of the best off-roaders on the planet, with its Terrain Response Technology adjusting its traction control and suspension setup according to the surface and conditions. In terms of its engines, a supercharged 3.0-litre V8 petrol engine is a good entry point. It develops 334bhp and has a 0-62 time of 7.1 seconds, but it’s only available with the Vogue SE model. It’s also hard to recommend because the equivalent diesel engines are so good. However, if your budget stretches far enough, you’ll want to take a look at the range-topping engine that powers the SV Autobiography Dynamic model. This is a fierce supercharged 5.0-litre V8 petrol that develops 543bhp, makes a thrilling noise, and which bullets its way from rest to 62mph in 5.1 seconds. For such a big car, that’s damn impressive. It’s supercar-esque. Is Land Rover reliable? Read our honest and unbiased assessment of their reliability. The Range Rover is absolutely dripping with luxury inside. It sparkles with quality trims, it’s comfortable, and it’s well insulated. It’s also elegantly designed, and while its controls are pretty to look at, they’re also solid and can be operated with gloves. It’s nice to see that Land Rover haven’t forgotten this car’s roots. However, luxury seems to be the prime focus here. 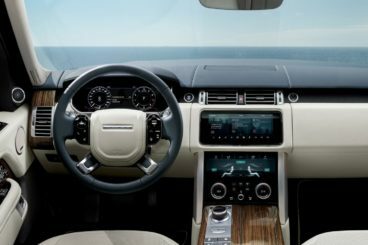 That’s not a bad thing, of course, and we’re quite sure that even the most hardened of Range Rover die-hards from years gone by will appreciate the wood-veneer and piano black lacquer inserts. Soft-touch materials abound, as do gorgeous and expensive leathers. Then there is the classy 10” touchscreen that comes with the brand’s up-to-date InControl Touch Pro infotainment system. Is the Land Rover Range Rover Estate practical? It’s worth mentioning that some models are long-wheelbase models, while others are short-wheelbase models. For example, the range-topping SV Autobiography Dynamic model is a short wheelbase model. However, all models are super practical. There’s enough room for five adults to get comfortable on longer trips, but the longer wheelbase version will be harder to park. That said, both models will make parking tricky, and they’ll also both be difficult to climb into. As well as the option of a short or long wheelbase, buyers can also choose between a five or a four-seat model. The latter is amazingly spacious and feels ultra luxurious. Storage space is good and includes a pair of gloveboxes in the dashboard, while the boot measures 909-litres. Fold the rear seats and that extends to 2,030-litres, which is just champion. Standard kit levels are very good – as they should be for a car at this price point. The entry-level model comes with heated front leather seats, a 380-watt Meridian stereo and 20” alloys. The Vogue SE model adds more adjustment for the heated and cooled front seats, as well as a power-operated boot lid. The Autobiography and SV Autobiography models net you bright xenon headlights, a glass roof, Bluetooth, a digital radio, sat-nav, a surround via camera, a digital TV and four-zone climate control. The SV Autobiography Dynamic model rounds things off with diamond-quilted leather and all kinds of interior and exterior embellishments that set it apart from the rest of the range. In terms of how safe the car is, Euro NCAP awarded it all 5 stars for its crash test performance, while its safety features include lots of airbags, advanced traction control and autonomous emergency braking. The entry-level models miss out on lane keeping assistance, blind spot monitoring and active cruise control, though. Prices for the new car start at £79,595 and rise to as much as £141,580. For more information on our leasing deals, you can check out our page here. In terms of its running costs, the Range Rover has a pretty voracious appetite for fuel. The 3.0-litre V8 petrol engine is very unlikely to return over 30mpg economy, especially on a daily basis, while the 5.0-litre V8 engine returns 22.1mpg at best. However, it will probably be averaging 15mpg, which will price it out of most peoples’ budgets. When you consider how big this car is, it’s incredible how refined it is. The cabin dazzles with luxury, no matter how much of an off-road warrior the car is. It can literally cope with any surface. Prices start out from just under £80,000. Don’t expect to return more than 30mpg from the “entry level” model. Let’s see how the car fares against its rivals in the comparison section of our 2018 Land Rover Range Rover Estate review. The new Audi Q7 is a slick-looking large family car that boasts a top-notch interior and lots of advanced safety kit. It’s also super affordable to run. On the road, the car does a decent job of smoothing out most road surfaces, but it’s well worth adding the optional adaptive air suspension as it boosts ride quality no end. Four-wheel steering is another optional extra that’s worth snapping up if you want to enhance the Q7’s agility. A brand new electromechanical active roll stabilisation feature, meanwhile, helps to reduce body lean. Without these add-ons, the car still offers an enjoyable driving experience. It weighs less than last time, changes direction faster and feels more composed on the motorway. In terms of its engines, a 3.0-litre 215bhp diesel sits at the bottom of the range. It covers the 0-62 sprint in 7.3 seconds, has a good amount of pulling power, but it does feel a bit breathless when worked hard. It’s also a tad noisy. A 268bhp variant of the same engine is your only alternative, and it’s a better shout. It can get you from rest to 62mph in 6.5 seconds, comes mated up to a complementary 8-speed automatic ‘box, and it’s bursting with character. Running costs? The smallest diesel can return 48.7mpg on a good day and emits 150g/km of CO2. The bigger diesel manages almost the same figures, returning 47.1mpg at best and emitting 158g/km. Inside, the Q7 is typical Audi affair. It dazzles with luxury, with the materials used plush and modern. The design is minimal, insulation is mostly good (with the exception of diesel clatter from the entry-level engine), while a 12.3” Virtual Cockpit digital display is the highlight of its dashboard. 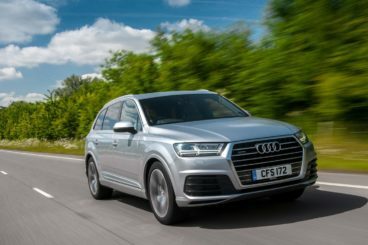 Is the Audi Q7 practical? It comes with seven seats as standard, but each row has a good amount of head and legroom. All seats come with ISOFIX child seat mount points, the 7-seater layout is configurable, and while the third row has been designed with kids in mind, smaller adults will be able to sit back there on shorter trips. The boot, meanwhile, measures 295-litres when all seven seats are up, and 770-litres when five seats are up. Fold all rear seats and its total capacity is 1,955-litres. The new BMW M5 Estate is the super fast and super powerful version of the 5 Series Touring. But is it really just pure indulgence? It’s super fast, super powerful – and also super rare. The M5 Estate – as awesome as it is – just doesn’t sell that much in Britain, whether that’s down to price, or the fact that buyers just don’t need it. True, we don’t tend to buy cars like this because of how fast they go. And with a 0-62 time of 4.8 seconds, the M5 is very fast indeed. Its sensational power comes from a 5.0-litre V10 petrol engine that’s paired up with a 7-speed SMG. The engine develops 500bhp and has a max speed of 155mph. Mechanically, the car is actually identical with the ferocious M5 Saloon, although that particular car can keep going until it hits 200mph. Both cars are rear-wheel-drive, agile, and offer an unreal driving experience. That said, this is no off-roader in the same way that the Land Rover is. It was born and made for smooth surfaces, and that’s where it excels. Running costs? Not pretty. The best the engine can manage on a good day is sub-40mpg economy, while emissions top 150g/km of CO2. That said, the car is surprisingly affordable to buy in the first place. Inside, the M5 is pretty much the same as the standard model. This means you get a well-built cabin, the latest version of the brand’s excellent iDrive infotainment system, and a 10.25” screen. The rotary wheel controller now comes with a smart character recognition system that speeds up the process of inputting words and postcodes, but if you specify the £150 Gesture Control feature, you won’t even need to use the rotary controller at all. 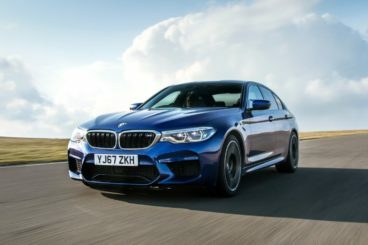 Is the BMW M5 Estate practical? It might be savagely fast, but this is also a really family friendly car. Space up front and in the rear is good for all, you can fit as many as 3 child seats in the rear, and the boot – which is bigger than last time – measures 570-litres. Fold the rear seats and you can extend it to 1,700-litres. So, is this car the champion of the world? It has the feel of a heavyweight boxer. Actually, scratch that – it has the feel of a Marine! Big, bold and fearless, the new Range Rover isn’t all about steel, however. As much as it likes to rough it in the wilds, it also has a taste for the finer things in life, as its opulent interior proves. The problem is, the new Land Rover Range Rover Estate also has a taste for fuel and it doesn’t come cheap. The verdict though, is that this is one of the best cars on the planet. If you can afford it, it would be rude to say no.